Growing up in the UK I didn’t eat lobster. One might come across old-school lobster thermidor in fancy restaurants in London but it wasn’t until I moved to New England in 2001 that I had my inaugural lobster roll. The first time my parents came to visit, I decided we’d have a beach day with a picnic of homemade lobster rolls. I wasn’t sure I could face putting the live lobsters in the boiling pot so I bought four lobsters at the supermarket and had them steamed. Back home, the bright-orange steamed lobsters stared at me accusingly from the kitchen counter with eight beady eyes. I realized I didn’t actually know how to get the meat out of them. After almost 15 years in the US, many of them in Maine, I now know that you crack the claws, twist off the tail and pick out the meat. Back then, I decided it was a good idea to take the largest knife and cut right through the middle of each lobster. Cleaver in hand, I split the first lobster open and recoiled in horror as green and orange stuff spilled out of the body. I called my Mom into the kitchen to share the sad news, the first lobster we bought must have been sick or diseased, but not to worry, we had three more lobsters that should be OK. Imagine my disappointment when all of the lobsters turned out to be bad, full of weird green and orange sliminess. I cleaned up the mess, throwing the lobsters in the trash and off we went to the beach, picking up sandwiches on the way. Later that night when I explained to my husband about how unlucky we’d been to buy four bad lobsters,once he stopped laughing, he explained about the tomalley and how to get the meat out of the lobster. If you find yourself in Portland, Maine with a craving for lobster rolls then you should hotfoot it to Eventide Oyster Co. This open and airy oyster bar serves the freshest oysters, thoughtfully composed small plates of crudo and lobster rolls that will haunt your dreams. There’s also a traditional New England clambake, lobster stew, fried fish and shellfish galore. Seating is at the bar, at the counters lining the windows, at a few picnic-style tables and outside in the warmer months. 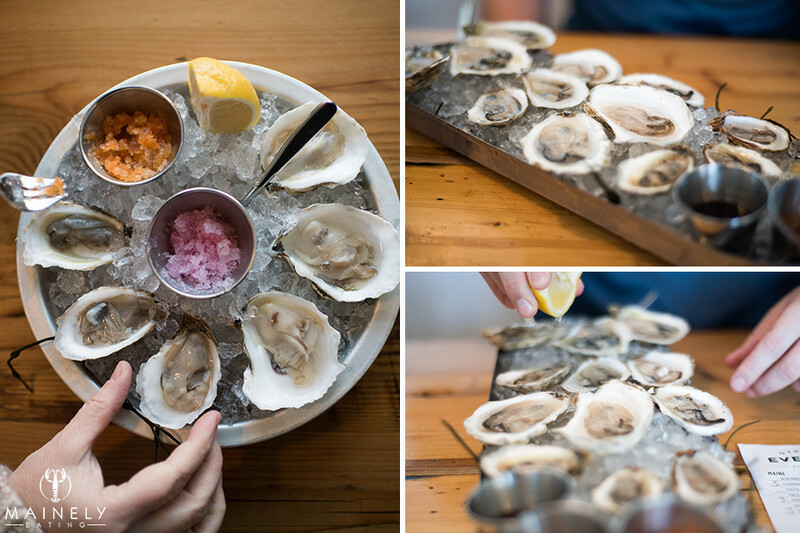 We usually start with oysters – Winter Points, Pemaquid or Beau Soleil are my favorites for their smaller size and clean, briny taste – there’s usually at least 10 or so different oysters with a good mix of local Maine oysters and those from further afield. Choose from a selection of accoutrements such as tabasco ice, pickled red onion ice or classic red wine mignonette. A side order of four bite-size warm and flaky biscuits with butter is also a great idea, so great that I always forget to photograph them until there are just a few crumbs left in the basket. A Persephone cocktail with St Germaine, a hint of lavender, a lemon twist and sparkling wine works well with the oysters. The bartenders will happily suggest a cocktail and there’s an extensive selection of local craft beers on draught or bottled. 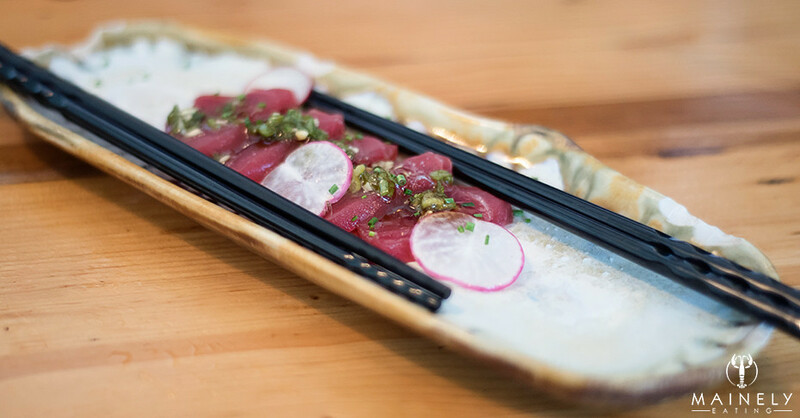 Check out the blackboard for ever-changing crudo offerings, the tuna crudo with an intense ginger-scallion tare sauce is melt-in-your-mouth perfect. If you’re not a seafood fan (what? what’s wrong with you!??! ), then you could try a buttermilk fried chicken bun with pickled watermelon and coleslaw (below left) but the lobster roll is where it’s at. The soft split bun feels reminiscent of Char Siu Bao steam buns and it’s filled to the point of overload with tender lobster meat lightly tossed in a brown butter vinegarette. Eventide doesn’t take reservations and despite a recent extension into the adjacent building, you should definitely expect a wait in the summer months (or get there at 11am when the doors open). You can check in, leave your number and get a text when your table is ready, and consider stopping by the Honey Paw next door while you wait. 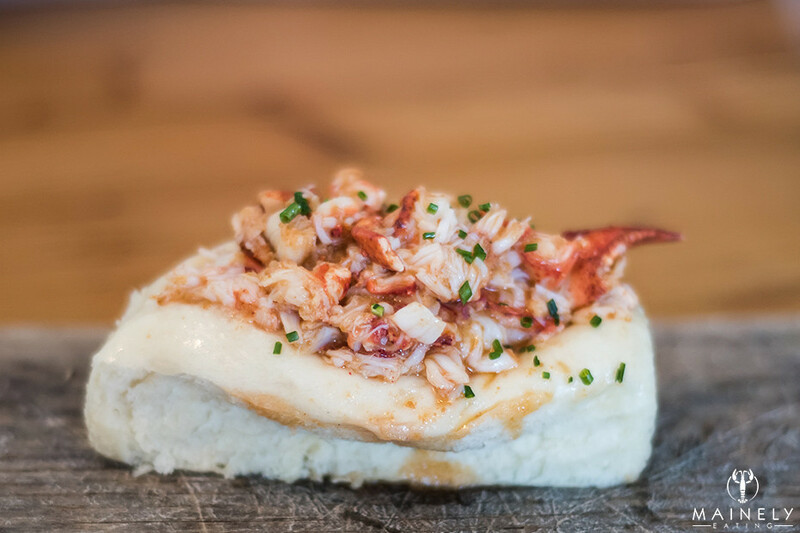 And the wait will be worth every single minute when you lift that soft, warm, brown butter lobster roll towards your mouth. The hardest part of your dining experience will be making the decision about whether or not to order another roll. Hours: 11am to midnight (daily), brunch 11am-3pm on Sunday and Monday.